The EI has revised its Human factors briefing notes resource pack and this is now available from the EI website (both for purchase as a hardcopy pack, or freely downloadable as PDFs). 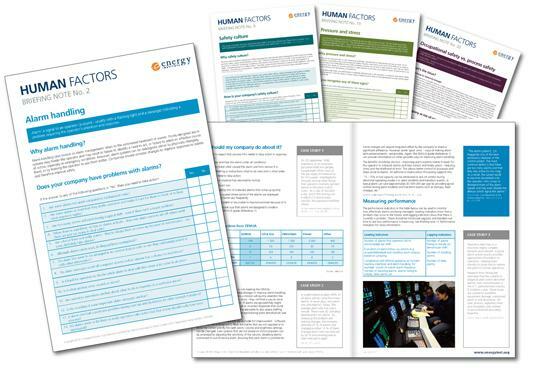 To improve industry’s understanding of key human factors issues, as identified by HSE, the EI’s Human and Organisational Factors Committee (HOFCOM) commissioned the first edition of the Human factors briefing notes resource pack in 2003. This pack of 16 briefing notes provided succinct guidance on specific human factors issues or topics (from fatigue to task analysis), supporting the HSE human factors key topics. The 2011 edition briefing notes have been revised, updated, and redesigned, making them easier to read, but also more practical to use. An introduction to a human factors issue. Guidance on what the company or management can do to address that human factors issue. ‘Negative’ and ‘positive’ case studies (illustrating both the consequences of an issue and potential solutions). Suggested performance indicators (PIs) for the HSE ‘key topics’. Notably, 15 of the briefing notes include a simple checklist of ‘yes/no’ questions to help you quickly gauge whether your company has a problem with that particular human factors issue. The briefing notes will be of interest to anyone wanting to gain an overview of human factors or of particular human factors issues they are facing, and to managers who are looking to apply practical solutions to solve these issues. Buy or download your copies of the briefing notes from www.energyinst.org/hfbriefingnotes, and let us know what you think (either by leaving comments below, or by emailing technical@energyinst.org). This entry was posted on Tuesday, July 26th, 2011 at 10:00 am and is filed under EI technical work programme, Human factors. You can follow any responses to this entry through the RSS 2.0 feed. Both comments and pings are currently closed. I’ve downloaded the lot & they look like great material. I’ll be putting them into a binder & making them available to others in our company. It would be a nice touch to have a suitable cover sheet to go on the front of the binder. Something that advertises them. We’ve produced the briefing notes in printed format on really good quality paper stock and they are supplied in a sturdy perspex folder. They are ideal for presentation purposes, handing out at workshops etc. The link above (www.energyinst.org/hfbriefingnotes) takes you through to the order page.